It’s getting closer. The longest surf trip so far in my life is getting closer, and I’m trying to prepare as much as I can. Except from surfing I also will work as a surf photographer on three different boot camps during this trip. Shoot surfing and also having the benefit of being able to surf every day, makes everything great for the moment. One other thing that’s also really great is that my kids will join me for a almost 10 days on this trip, before they have to go back to school. So much fun surfing with your kids. And as they are growing older you don’t have to look after them as much as you used to. They are turning in to your surfing buddies. They are really nice travelling partners as well, open minded, like to surf, and love to just chill. Last trip I had with my kids was a two week surf trip to Lagos. So nice, would like to do it again next summer. My kids, Sandra and Linus enjoying the surf. The photo job is to cover some boot camps at The SurfExperience, starting out with a boot camp for girls. Sam Lamiroy is the surf coach for the boot camps, and a great one as well. Surfing and shooting surfers all day long from early morning until the dark falls. After a week on the boot camp I usually ends up with 10 000 picture that I have to go through an edit the good ones and then send them to the Boot campers. The deal is that they get all the pictures of them surfing. During the day we also (not me) do video recordings of the surfers. In the evening Sam goes through the video material with the boot campers and talk about what they needs to think about etc. This is Georgie Timson. An awesome and talented surfer from Newqua. I wouldn’t be surprise if we will see her on the WSL-tour in a couple of years. Annie from Sweden. Every time I surf with here I get amazed about how much better she have become. Milla from Newqua. OMG lots of laughs when she is around. Except of just trying to improve her surfing she also did a serious try of learning Swedish. She did pretty well actually, with surfing and Swedish. The group after a long day of surfing. The lines still rolling in in the background as you can see. You’ve all red it before! “You never regret that you didn’t worked more in your life when you are about to die and you are summing up your life” Most people regret they did not live the life they wanted to, they lived a life that other people expected them to live. Or that they did not spend more time with their kids. Or that they did at least a few things they always dreamed about to do. What does it take to (as we say in Sweden) “get your as out of the wagon” and start living the real life? I guess you have to understand that you’re not on this planet forever and that you eventually will die. Most people knows that they got a limited time on earth, but to really understand it usually takes some overwhelming life experience to get the message. I not saying that I totally got the “message” but after my father past away recently and my mother nearly did too due to a stroke (luckily I was there to get her in to the hospital in time) I’ve realized that we will die, so the process have started in my mind and I try to figure out what is important for me. So today I will leave work early and go surfing, because the waves are rolling in at my local spot. Maybe I should bring my kids, but they have to be in school, and they have to live their life as they want to not the way I want to. It’s strange how afraid we are of dying and not be able to live and still we forget to live. That’s why I’m going surfing today. Sally Fitzgibons “living the dream”? during the womens surf pro tour 2014 in Cascai. Jez Browning. A friend that quit his day time job and moved to Portugal and became a surfinstructor. Today he runs his own surfcompany teaching surfers all around the world how to surf. So what do you do when there aren’t any surfers to shoot pictures at or the surf is to bad or you have to spend a couple of hours on the beach waiting for the waves to kick in. Well I usually starts to look where I’m sitting. Some times we sit on a different world we aren’t aware of. I’m talking about our friends the Bugs. Lots of different cool creeps on the beach. If you start looking you usually finds lots of things to shoot while you waiting for the waves. You don necessary need a macro lens, you can always zoom in in your picture when you editing it later in Photoshop. This spider was shot with my old tamron 150-300 mm lens and then in the editing process i zoomed in on the spider. This one is really small, maybe 5mm so its when you zoom in then you can see how beautiful it is. This one was really tricky to shoot. Its the ones that don’t hunt with a Webb it jumps on their pray instead so they are super fast. But I manage to get a decent shot after a couple of tries. Anyway its lots of fun trying to shoot them with your camera. My daughter found this lizard on the beach. You don’t need a macro lens or to zoom in on it, this one is quite big. Never seen anyone like this one before, so I’m very happy my daughter noticed it in the sand. The lizard just sat there and was ok about me taking some pictures of him/ her. Doing surf photography demands that you get into the water, well maybe not totally true. You can make it from the beach with a decent lens, as I have done so far. For a long time I have wanted to take the step into the sea with my But sooner or later you want to step into the sea with your camera. Last year I bought a water proof Nikon AW1 and did some shooting from the water. But that camera did not really work for me. Dont think the image quality was good enough and I had to send it back after that I got some water into the camera. I have been checking out water housings that are made for surf photography, but they are really expensive. So I got little bit excited when I found this one. It fits my Nikon D7000 and it got all the controls I need. And the price was in my range of what I can afford. I had to do some modification on it to get it work properly but now I’m ready to go. Going to Portugal in a couple of months and I will bring with me. And yes I will start out in small sized waves… water photography is so much more than just shooting pictures. Sometimes you have the picture you wanna take in your head before you even get to the beach. You thinking, great light, awesome backdrop and a surfer doing an air in the foreground. And yes the surfer gonna wear board shorts and a shirt. Not really an easy task to fulfill if you not working with someone who knows what he’s doing (the surfer) But this time it wasn’t my idea it was Sam who came up with the idea. He told me -“I’m gonna surf this hypto crypto board down there in the end of the beach. And I’m gonna do an air with that cool rocky backdrop behind me. So be ready with your camera ok?” He paddled out and I stood there thinking “he is the greatest surfer I know but can he just pull it off like that?” And sure enough, the second wave he caught he was flying, just as he told me. I got the camera up and shot four images and one of them turned out to be ok. So my point is when you working with professional surfers don’t be afraid to tell them what kind of picture you wanna take. They got lots of skills and will probably pull it off and make you a happy photographer. 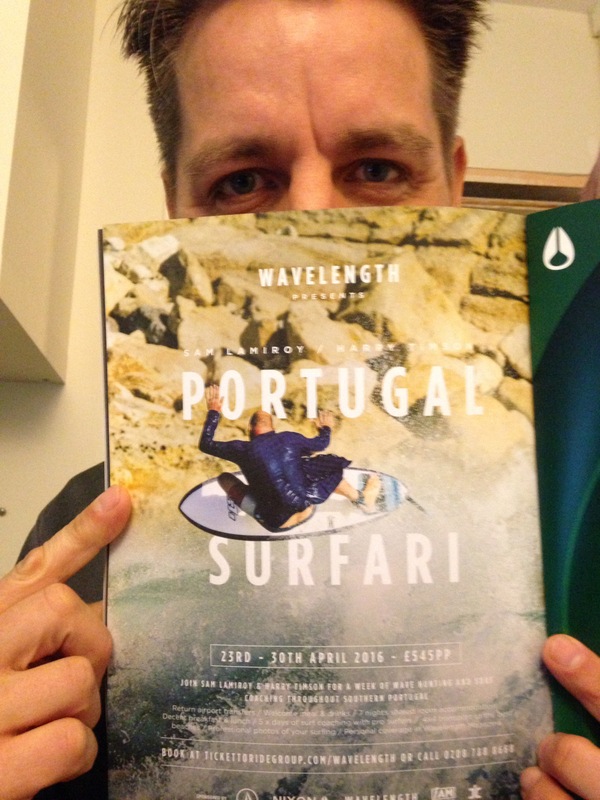 And the really happy ending of this story is that Wavelengths Surf Magazine later used that image to promote one of their surf trips down to Algarve, Portugal. This photo was shot in late November on the southern part of the west coast of Portugal. Usually you need 3mm wetsuit when you surf in Portugal, special in November, but if you are lucky the ocean can get warm enough for surfing just in board shorts, even in late November. The surfer on the picture is Sam Lamiroy. He is a surf coach and a good one too. This is in the end of the day, and the sun just started to set so the colours looks warm and nice. just like the ocean. I really like the green colour in the water and that Sam is almost in silhouette. In the end of the day I had a bunch of photos like this. Its also nice to be able to shoot surfers in board shorts and not in wetsuits. I’m going back to Portugal in October to work with Sam and The Surf Experience on the Boot Camps. If I want my pictures to be black an white I always convert them in the post editing in Photoshop. I never change the settings in my camera to black and white. Why? I simply want the possibility to choose between colour or blank and white. There are so many different ways to convert your picture to black and white in Photoshop. If you do a search on You Tube You will find several great tutorials that will cover this topic. When ever I want to do something in Photoshop and I don’t have the knowledge how to do it, I will do a quick search on You Tube. Best teacher on the Internet. There are a lots of really bad tutorials, but you just skip them and go to the next one. I use You Tube for a lots of things actually. Lots of great guitar teachers out there giving you tips how to play for free. This picture in two different versions, it was shoot at Fistral Beach in Newquay. I spent a weekend on Tim Nunns work shop. The pictures shows the different between colour and black and white. Its ok in colour but I think it gets more power in the black and white version. I’m always on the look to sea if my pictures will do better in black and white. Love the feeling you get in black and white pictures, most surf pictures are in colours…. When I go surfing, usually to my local spot, I always think if I just catch one wave the whole trip is worth it. But some times when its to big or to small and you just don’t catch any thing, I sometimes think just sitting in the ocean is not a bad thing. Sitting there in the ocean on your board and feeling the motion of the sea or watching the sun set makes you feel humble, happy and relaxed. Nature makes you feel small in a good way, most of the times. I’ve read that when we enter the ocean our hart beat slows down. If we hold our breath and get our heads under the water the hart beat slows down up to 10-25% For a skilled free diver it can slow down as much as up to 50% of its normal rhythm. Maybe that’s why we feel so relaxed and happy when we enter the ocean, I don’t know. But what I know is that it makes me feel happy. And the when you sit there feeling like a happy hippie suddenly that wave comes along. You catch it and you are flying down the line, or it feels like that any way. And when the ride is done, you don’t give a shi.. about sunsets or hart beats, you just want to catch one more and then one more…. This picture is shoot in Newquay. Behind the cliff lays Fistral beach. I used my 150-600 mm Tamron lens. The distance between me and the people on the picture makes them look large against the sun. Its a cool effect anyway. From a lovley evening in Portugal, algarve not far from Lagos.